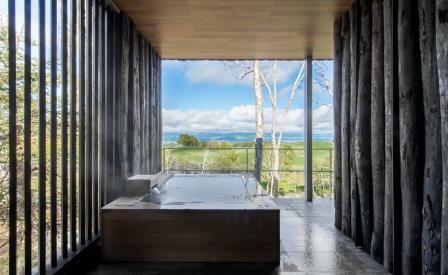 Set amongst the leafy canopy of a peaceful forest, against the serene backdrop of Hokkaido’s pristine landscape, Zaborin is the area’s newest retreat, just a short drive south from the city of Sapporo. Comprising just 15 villas – all of which overlook the endless bucolic terrain – the property sits snugly within the surrounding greenery, providing optimum immersion into the area’s idyllic location. Local architect Makoto Nakayama, boosted the characteristics of a traditional ryokan, with the addition of floor-to-ceiling glass, modern furnishings and concrete details. Each room meanwhile, comes with its own indoor and outdoor onsen, which are filled with the same natural spring water used for the under-floor heating and to melt the snow-covered pathways in winter. In the kitchen, chef Yoshihiro Seno serves a choice of authentic teppanyaki and kaiseki fine dining, ensuring guests never have a reason to leave.